When operating in fragile states, donors and implementers working in the police, justice and corrections space need to incorporate a complexity lens if programs are to effectively respond to the realities of the context. Moving from ‘simple’ or ‘complicated’ understandings of the issues, to one that accepts the complexity inherent to the process is best, particularly when these issues are exacerbated by systemic corruption. This lens adjustment contributes to identifying strategic opportunities, developing more plausible theories of change and understanding possible unintended harms. Field tested in three countries in Central Africa, Understanding Corruption in Criminal Justice as a Robust and Resilient System,Version 1.0 offers a systems-based corruption analysis process developed specifically to respond to the complexities of the criminal justice system (CJS) in fragile states. The needs assessment approach reduces the justice system’s dysfunction in fragile states to its pieces. This fits well into classic aid modalities; the issues become easier to communicate, make into a project, bound into a short timeframe and in stable, functioning environments may actually hit the mark. However, when the context shifts to one of fragility, a simple approach misses the interdependency that exists between those pieces, the uncertainty of the environment and the role of power; power within the system, within official roles of the state and power derived by wealth and status that is central to how these processes operate. The typical result; projects that work at the surface without touching any of the real issues in the system. To put it in evaluation-speak: irrelevant and ineffective. Some working in this sector stress that police, courts and corrections need to be viewed as a system. This places emphasis on the connection between the three sectors — like a chain — where a problem in one impacts the other. This more ‘complicated’ viewpoint (using the Cynefin meaning of the term where there are multiple right answers and with expertise the cause-effect relationship is clear) typically relies on the technical expertise derived from decades of working inside the sector. To respond strategically in these scenarios, one needs complete information that provides clarity on the problem as understood with contextualized expertise. Fragile contexts make obtaining this information very difficult, ever more so for those who have derived their expertise from stable contexts elsewhere. Projects are often completed, but without sustained positive change. To steal from an old adage – a wolf in sheep’s clothing – police, courts and corrections dysfunction in fragile states are typically complex problems that get dressed up in complicated or simple clothing by the international community. Complex problems are multi-faceted, have interdependent causes and consequences and are in constant flux. They do not have ‘an’ answer. Responses to complexity require a longer time horizon and a more experimental form of management; where solutions are not guaranteed and failing is understood to be part of the process. What is it about fragility that makes a simple or complicated approach ineffective? If the role of these institutions regardless of context is generally the same, what is it about fragility that demands a complex response? There are many factors: the lack of separation between public and private spheres, the influence of power and politics on the institutions, the cycles of violence and uncertainty, the consequences of trauma on individuals, and critically, the systemic corruption within the CJS. After researching the role of corruption in the CJS in the Democratic Republic of the Congo, Uganda and Central African Republic over the past five years, the inability to separate systemic corruption from the functioning of any of these institutions is abundantly clear. Yet the responses funded by the international community either ignored the existence of systemic corruption or adopted simple or complicated responses. A mismatch that results in ineffective programming at best and contributing to the problem at worst. Adopting a lens of complexity to understand the problem before turning to solutions is the first step. To help in this we have developed a systems-based analysis process for corruption in the CJS. This is a move away from measuring the problem e.g. the amount or frequency of corruption in the police (a very ‘simple’ approach to the problem). From a monitoring and evaluation perspective this is possibly helpful, if you have confidence in the instrument and veracity of the responses. But it does not provide any insight into what would be relevant and effective responses. 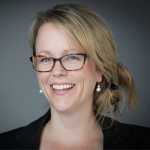 It is also different from a corruption risk perspective – a more ‘complicated’ approach – that supposes that there are ‘answers’ based on the application of the right expertise. The easiest way to explain a systems-based corruption analysis is to break the process into its component parts. A corruption analysis is the identification of the factors that generate the patterns of behavior known as corruption. In the CJS in fragile stages, research shows corruption typically means bribery/extortion, sexual favors, favoritism and political interference. Each of these factors — drivers, enablers, effects, and mental models — are important in sustaining the pattern. – Drivers are those factors, such as social norms that cause people to participate in corruption. – Enablers are factors that facilitate or make corruption possible, but are not the reason why it happens. – Effects represent the outcomes of the corrupt practices. How citizens and members of the CJS themselves—as well as broader societal dynamics—are affected by a range of questionable or outright abusive actions. – Mental models are ways of framing or thinking about issues, generally implicit, that often influence behaviors. Once the relevant factors have been identified, the next step is to organize them in a series of “causal loops” that show how they interact with each other as a system. Adding this systems-based component advances the analysis beyond a simple list of factors. Instead it creates a “map” of how the factors relate to each other to produce consistent patterns of corrupt behavior. 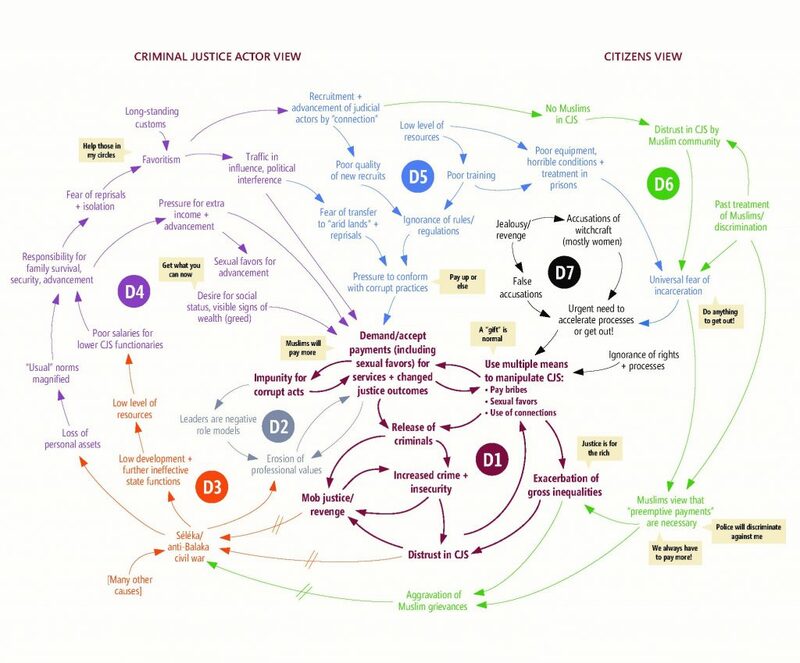 The resulting causal loop diagram or “systems map” provides a visual tool that can be used to identify “leverage points”—aspects of the corrupt system that are susceptible to change. 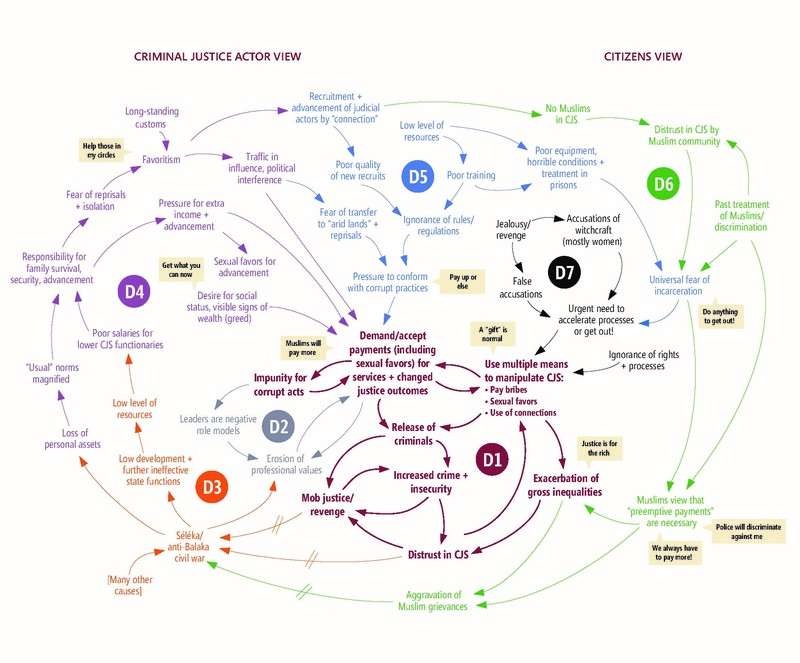 The systems map can also exhibit how aspects of corruption in the CJS are embedded in larger social, political and economic processes—affected by them and contributing to them as well. Systems Map of Corruption in the Criminal Justice System in Bangui, Central African Republic. From “Pity the man who is alone” report. How will this help improve CJS programming? Generating a systems-based understanding of corruption in the CJS in a fragile state gives donors and implementers several important advantages over other approaches. The explanation of drivers, enablers, effects and mental models provides a comprehensive sense of how and why the system functions. Feedback from local actors suggests that the broader systems focused approach delivers a more authentic representation of their experience compared to other approaches. The visual depiction, as represented by the causal loop diagram, allows practitioners to see how the different factors that drive and enable corrupt patterns of behavior are related to each other. This can aid in the identification of points of intervention that are outside typical program thinking. One such example is Kuleta Haki; a CJS anti-corruption effort implemented in the DRC. See here for a summary of this approach and lessons learned in two years of implementation. Practitioners can use the systems map to hypothesize how their program would impact the system if successful. In a similar vein, one can use the map to look for ways the system will likely “push back” against change efforts. By plotting existing anti-corruption (explicit or implicit) theories of change onto the systems map, gaps in programming, redundancies and strategic alliance opportunities become apparent. A full description of the methodology to conduct a systems-based corruption analysis in the CJS, complete with our lessons learned, interview protocols and recommended reading, is available on the CDA or Fletcher School websites. After three cycles of testing, the methodology offered provides a sound basis for understanding corruption in the CJS. It is not yet perfect and hence the title: Version 1.0. With further implementation and reflection, we believe useful refinements are possible that will continue to contribute to the development of more effective responses. Now hosted by the Henry J. Leir Institute, series contributions are inspired by, but not limited to, the Corruption, Justice and Legitimacy project as well as the, now concluded, Central Africa Accountable Service Delivery Initiative. We are privileged to also have posts from a number of prominent thinkers, policy makers and practitioners as guest bloggers. The Corruption in Fragile States Blog Series has MOVED! The Henry J. Leir Institute, at the Fletcher School of Law and Diplomacy, Tufts will be our new home as of March 1, 2018. Find future blog posts, submit a guest post, and subscribe to series updates here.